All compositions and arrangements by Pedro Giraudo. 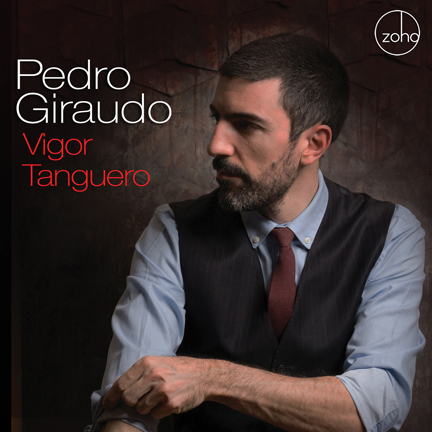 Vigor Tanguero is the first tango CD for bassist, bandleader, and composer Pedro Giraudo. After releasing five remarkable albums performed by various formats of jazz ensembles, his gaze was captured by the glint of tango. Perhaps it was only matter of time, as Giraudo hails from the birthplace of tango, Argentina, and so this album is a homecoming of sorts. A man revisiting the music of his country and culture, contributing not something homespun but tantalizing and suggestive. “I enjoyed every second of the process,” said Giraudo, who seems capable of scaling any musical summit. He wrote these pieces for the brilliant quartet of Nick Danielson (violin), Rodolfo Zanetti (bandoneón), Emilio Teubal (piano), and himself (bass). And by so doing, he realized that his works were in fact rooted in the best of the tango tradition. Each selection can be categorized and described according to one of three tango rhythms: milongas, valses, and tangos. Of course, there are some exceptions, but throughout you’ll hear Giraudo tinkering and experimenting with the fundamental tango rhythmic cells  pushing, pulling, even suspending the syncopated feel as he engineers a new aesthetic or archetype for this music that he loves. “I tried to express many emotions on this album: happiness, joy, passion, sadness, intimacy, vulnerability, and playfulness,” he says. No matter what this album makes you feel, it will be borne out of authenticity, as Giraudo’s genuine spirit shines through each note, beat, and breath. The first piece Vorágine means “Whirlwind” in English, but it’s not an exact translation, as Giraudo has struggled to find a word that conveys the chaos and confusion that afflict those living in New York. “This is my anthem for the city,” he says. He constructed the piece with a straightforward ABA form, with an almost identical introduction and coda. The first section is through composed with an unstable eight-note scale that late French composer Olivier Messiaen (1908  1992) employed with aplomb. The subsequent section is right out of the Astor Piazzolla (1922- 1992) playbook, with obvious tonal and timbral references to the late tango grandmaster. Entre Bambalinas translates to “Between Scenes” and is a reference to those fabric dividers on stages. The term is used colloquially to describe what happens backstage or behind closed doors. The bass elegantly presents the prelude and epilogue. Between these parts is the main ABA section that invokes a waltz meter: at times the twelve eighth notes which are placed in two measures, grouped in the unusual manner of 3-2-3-2-2. In this piece, we hear Giraudo demonstrating his prodigious compositional talent, moving the beats across the mountains of his mind. Giraudo wrote Con Un Nudo En La Garganta or “With a knot in the throat” in 2004 for his jazz orchestra and it eventually became the middle movement of his epic and noteworthy “Desconsuelo Suite” which can be heard in its large ensemble version on his other 2018 ZOHO CD release with the WDR Big Band, “An Argentinian in New York” (ZM 201804). This piece is total tango and channels the best elements of the tradition. Hearing how brilliantly his large band performed the piece, he wanted to arrange it for his tango quartet. And you can hear for yourself  it’s an intoxicating melody with beautifully sparse and stirring chordal accompaniment. Chicharrita or “Cicada” is an homage to Osvaldo Pugliese (1905-1995) who was a towering leader and figure in tango’s enigmatic history. As a composer, bandleader, and pianist, Pugliese had a unique style characterized by lush landscapes of sound. Yet he had a high-pitched voice which earned him the affectionate nickname of “Chicharrita.” This piece was commissioned in 2015 by Giraudo’s friend and trumpetist Hiro Noguchi, and this is ultimately Giraudo’s take on the traditional milonga that pays respect to Pugliese. It begins with a rubato introduction, which gives way to a descending and chromatic line that lingers in your hearts and stirs your soul. The comparison to the fully orchestrated version of Giraudo’s composition is again fascinating, it can also be heard on his WDR Big Band collaboration “An Argentinian in New York” mentioned above. 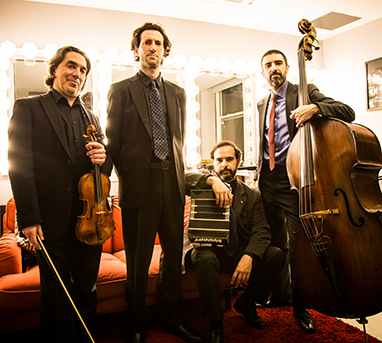 From left to right: Nick Danielson, Emilio Teubal, Rodolfo Zanetti, Pedro Giraudo. Photo by Erin O'Brien. A Octavio Brunetti (Dedicated to Octavio Brunetti) (1975  2014) is a song of friendship. Both Brunetti and Giraudo were beer enthusiasts, and during one of their many tours of Japan, they came up with a ditty with the Japanese lyrics “Biru No-mou-ze,” which means “let’s have a beer!” They would play or whistle the motive (A-A-D-F#-F#) after a long day of rehearsals, as siren calls that it was time to enjoy a drink. When Giraudo embarked upon writing a piece for his dear friend Brunetti, he remembered the motive, and constructed a full tango (with the traditional ABABA form) borne of levity but bedazzled with bleaker harmonies. Desavenencias or “Rifts” is Giraudo’s first foray into writing traditional tango waltz, as he invokes a classical minuet and trio with proficiency and skillfulness. Also commissioned by Hiro Noguchi, Giraudo adapted the piece for his tango quartet. La Rabiosa or “The rageful woman” is just that  a piece Giraudo wrote to describe an angry lady. It’s based on a rhythm from the countryside known as the chacarera that has a particular musical and dance structure. The atonality and jarring lines convey anxiety, frenzy, and even rage, showing that music can be vehicle of every expression. Giraudo originally wrote this composition for his big band, as the 3rd movement of the Angela Suite, and it is featured on his 2015 ZOHO CD release “Cuentos” (ZM 201503). The last three selections are meditations on extreme feelings, from total awareness, to letting go of all fears and desires. Lapidario or “Merciless” is a term that Argentinians use to describe a comment that cuts, hurts, and is harsh. Giraudo juxtaposes two themes, one which is forceful, built upon certain triads, whereas the other is more melancholy and thematic in nature. Taken together, these themes represent two sides of an argument, or rather, the syncopation at the heart of the tango. Desapego or “Detachment” is a non-obvious penultimate piece. You almost expect a tango album to end with adventure and escapade, yet Giraudo renders his selection with a vals that draws upon folkloric influences and casts a broad emotional range, only to end with a feeling of non-closure. You are left wanting, but that’s the point, to detach from the desire of resolution, and to realize that life is an ellipsis…and we can’t always fill in the blanks. The album ends with A Campo Abierto or “In the open field,” a searing and emotive composition that also incorporates folkloric traditions. Giraudo employs the rhythm of vidala or vidalita which treats space and silence as a central element. It’s a poignant ending to a very personal album, one on which we hear what happens when a tango master looks into the mirror and gives every bit of himself. Recorded at 2nd Story Sound, New York on August 7-8, 2017. Recording and mixing engineer: Alex Venguer. Mastering engineer: Oscar Zambrano - Zampol Productions. Producers: Kabir Sehgal, Kenya Autie, Alex Venguer. Liner Notes: Kabir Sehgal. Photos: Federico Rodriguez (cover), Erin O’Brien (group photo). Painting, “Cartas de amor” (Love letters), by Daniela Aphalo. Art direction and package design: Al Gold. Executive producer: Joachim “Jochen” Becker.